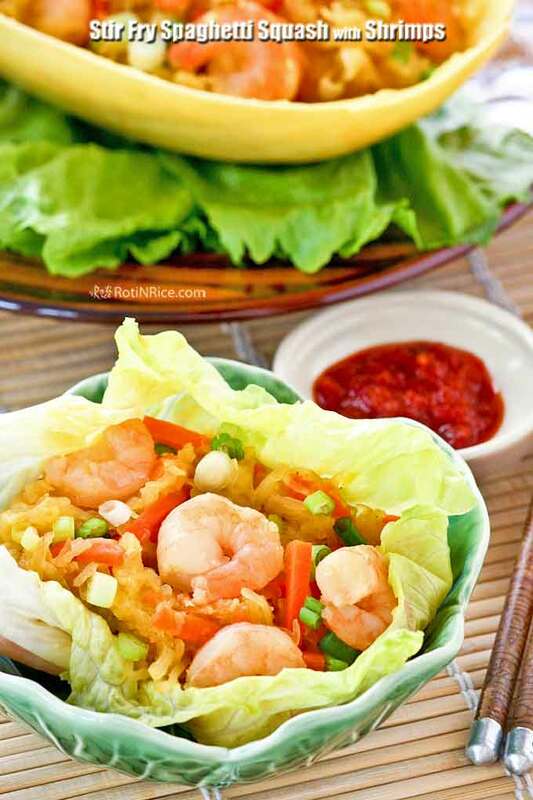 This delicious Stir-Fry Spaghetti Squash with Shrimps is a twist on the classic Jiu Hu Char (Stir Fry Jicama), often served as a filling for lettuce wraps. Spaghetti squash is a long oblong winter squash with a bright yellow rind. It actually looks more like a melon than a squash. The flesh is creamy yellow in color and solid when raw but falls away from the fruit in strands or ribbons like spaghetti when cooked. The best way to cook it is to cut it in half lengthwise and baked, boiled, or microwaved to get nice long strands of flesh. This nutritious squash is low in calories and can be used as a substitute for gluten free pasta. The flesh is very mild tasting and works well with most sauces. I really should use it more often in my cooking but the only other recipe on this blog that uses this ingredient is Tutti-frutti Spa-ghetti, a salad I created on a whim. With the New Year just round the corner, this month’s theme for World on a Plate is Auspicious Food for a Prosperous New Year. I am representing Malaysia and the Chinese community there have many different dishes that are considered auspicious because they are puns on Chinese words. 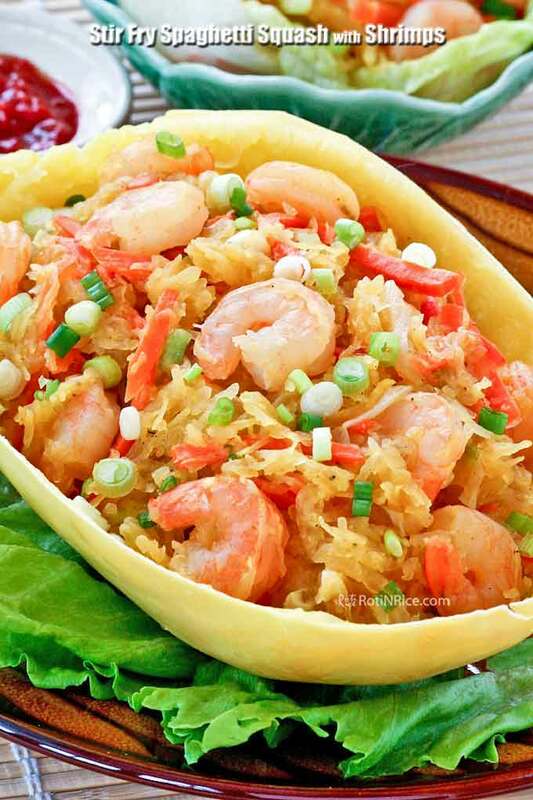 This Stir-Fry Spaghetti Squash with Shrimps is a twist on the classic Jiu Hu Char or Warm Jicama and Cabbage Salad, a popular dish at my parents’ home cooked for the Reunion Dinner during the Chinese or Lunar New Year celebrations. That dish uses jicama as the main ingredient. In this version, I have substituted the finely shredded jicama with spaghetti squash. I was delighted that the results were surprisingly similar. Split the spaghetti squash in half lengthwise. Scoop out seeds. Place on a baking dish with cut side down and bake for 40 to 50 minutes. Remove spaghetti squash from oven. When cool enough to handle, use a fork to gently scrape around the edge of the squash to shred the pulp into strands. In a wok or large fry pan, heat vegetable oil. Sauté onion and garlic until fragrant, about 2 to 3 minutes. Add shrimps and cook till they curl. Add carrots and spaghetti squash. Stir to mix well. Add soy sauce, salt, and pepper. Continue to cook for another 10 minutes. Turn off heat and stir in sliced green onions. Remove and serve warm wrapped in lettuce leaves if desired. A lovely seafood stir-fry. Beautiful presentation too, Biren. I’ll make sure to try some here in Malaysia! Looks like a great dish! Your spaghetti squash recipe looks delicious.I have several home grown squash from my garden and I will try this dish.Will let you know the result. Happy And Healthy New Year to you and family. Congratulations to Roti And Rice on your 3rd anniversary.May you have many many more years to come. Thanks Dorothy for you kind comments! So nice to have your own homegrown squash. Happy New Year to you too! Wow! That does look just like jiu hu char! How very clever – no need to shred all that bang kwang! Your fingers must be very grateful LOL I would love some with hot rice and sambal belacan. 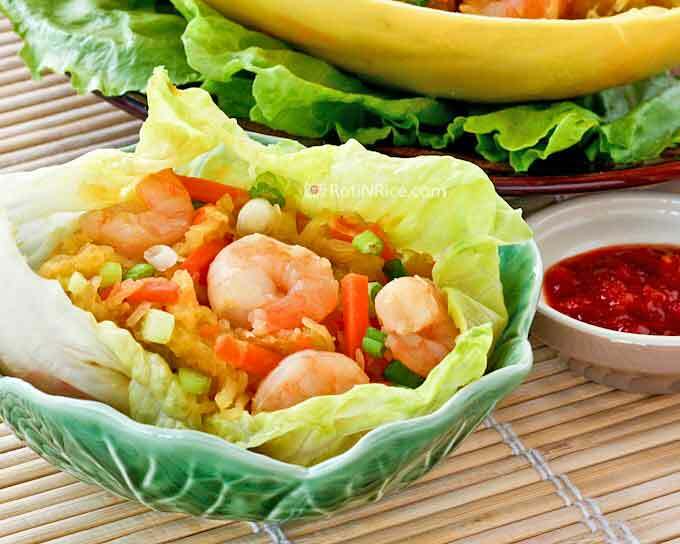 I’ve never eaten it out of lettuce cups, the traditional nyonya way, but I’m guessing it’s just as delicious. I have been wanting to make jiu hu char with this for a while but had to wait until it is in season. Once cooked with soy sauce, the taste is pretty similar. Need to make some sambal belacan next time. Do try it next time with the lettuce cups with sambal spread at the base…sedap! Spaghetti squash is not something we see here or I have not come across it yet! Sounds like a very versatile squash and looks beautiful too! Happy New Year ! Looks wonderful!! Wishing you a Happy and Wonderful New Year 2013!! This is such a nice, healthy dish! The flavor looks tremendous. Congrats on 3 years of blogging, and Happy New Year! Thanks for the compliments and congrats! Happy New Year! Beautiful dish Biren! Wishing you and family a beautiful and love filled 2013! What a wonderful dish! 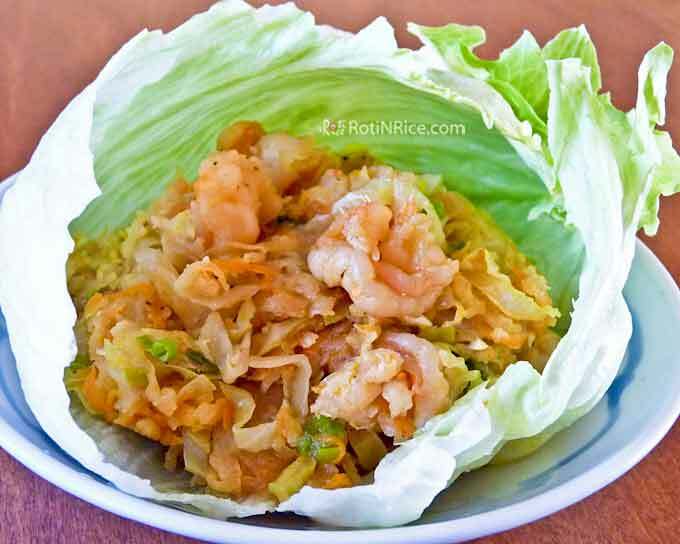 I love the meaning of the words for shrimp and lettuce – sounds like the perfect way to start the new year! Glad to hear you like the dish. Happy New Year, Katherine! 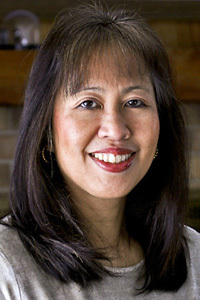 Happy anniversary to your blog Bee Ren! I love learning about other countries’ traditions! The dish looks very refreshing and shrimps are one of my favorite seafood. Have a wonderful and happy New Year! I never knew shrimp represents happiness. The dish looks absolutely delicious! Happy New Year to you and your family, Biren! Finally I cooked my home grown squash according to your recipe and it turned out deliciously yummy.The natural flavor is very sweet. Hi Biren, where can I buy spaghetti squash from in Singapore? I couldn’t find any in Cold Storage. Thx.